Skills and Abilities: Trained in armed and unarmed combat by the X.S.E also excellent street fighting skills thanks to life on the street. Powers: Bishop is a mutant with the ability to absorb and re-channel energy; whether in its original form or converted into concussive force. He can also internalize absorbed energy to boost his stamina and healing. This internalized energy also gives him a measure of resistance to injury and superhuman strength. After losing an arm he got a cybernetic one powered by nuclear energy. This enables him to self generate energy by feeding off the arm. 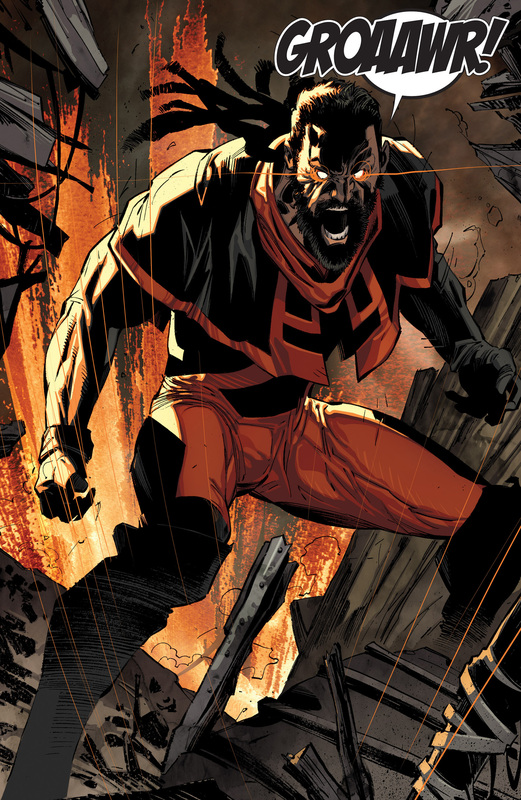 Despite his grandmother’s best intentions Bishop grew bitter and hateful as he heard that the ‘mutant messiah’ grew up to kill one million humans and thus caused the widespread hate mutants now faced and their cruel lives [Uncanny X-men #494 and X-factor v3. #27]. When the Summers rebellion erupted both his parents were killed which further traumatizing him [X-men: The Times & Life of Lucas Bishop #1]. Bishop also lost his sister int he ensuing chaos and he escaped through the fences. Free of the concentration camp alone and orphaned he began to steal and came to the attention of Lebeau also called ‘the witness’ who had apparently been the last to see the X-men alive [X-men: The Times & Life of Lucas Bishop #1, XSE #4]. For the next several years he was trained as a thief by Lebeau who told him his version of the X-men tales. He detailed how the “Askani son had protected the messiah until it was too late to stop her”. Just as mysteriously as he came into Bishop’s life Lebeau then disappeared. He was later captured and sent to the only remaining concentration camp in Las Vegas where he was reunited with his ‘Grandmother’ and sister Shard. When the government later freed the mutants during the emancipation they were kicked out onto the streets [Uncanny X-men Annual 1996 and X-men: The Times & Life of Lucas Bishop #2]. A year later their ‘grandmother’ died and Bishop promised her he would take care of Shard at all costs. Using the skills he learned from Lebeau he made a life for himself and his sister Shard. Mutant rebels known as the Exhumes had then taken root and the X.S.E Xavier’s security enforcers had been created by the remnants f the Summer’s rebellion to police their own. After aiding the X.S.E rescue Shard he vowed to join their ranks one day [X.S.E #1]. When his friend is killed before his eyes and the perpetrator threatens Shard he manifests his powers for the first time. This is witnessed by X.S.E officers and they offer him a place in their ranks. He agrees but only if Shard comes as well [Bishop #3]. As a recruit he became rivals with Trevor Fitzroy. After surviving an attack by ‘Emplates’ he became the youngest cadet to become an X.S.E officer. A year later Shard would bet his record [X.S.E #1-2]. Fitzroy also dated his sister. Randall and Malcolm were later put under his command, they were the Omega Squad. When Fitzroy defected from the team and became the most notorious criminal in their time their rivalry only got worse. Going against orders he brought in Fitzroy who told him of a place where many exhumes were located in hopes of getting leniency. Having had a falling out with Shard earlier he gave her the info in hopes that she would get a promotion. It was a trap and Shard became an Emplate. Battling the Omega squad Bishop took his Emplate sister to Lebeaue who managed to store her essence in a holographic projector. In exchange he worked for Lebeau for one year [X.S.E #3-4]. Hellbent on revenge Bishop and his squad tracked Fitzroy and stumbled onto the X-men’s war room with a cryptic message from Jean Grey right before she is seemingly killed [Uncanny X-men v1. #287]. Bishop was present when Fitzroy materialized a huge portal transporting the very worst criminals of his time back to the past. His team leaped through the portal in hopes of ending the threat. Face to face with the legendary X-men he was reluctant to believe he had been sent back in time. He and his friends started killing the villains much to the shock of the X-men, Fitzroy however escaped [Uncanny X-men v1. #282-283]. The team tracked the prisoners to a nightclub where his friends sacrificed their lives to save him and Storm took him to the X-men [Uncanny X-men v1. #287]. Upon joining the team he met Gambit who he suspected of being the traitor who would betray the X-men. This caused much tension on the team. Forge helped to fix the Holographic projector which housed his sister’s consciousness [Bishop #1-4]. Bishop was one of the X-men sent back in time to stop Legion from killing Magneto. When they failed the Age of Apocalypse was created. When his counterpart from the AOA died the memories from that dystopic future entered his mind [X-men Omega]. He helped Generation-X to fend of Emplate and his hellions [Generation-X #13-14]. The traitor was later revealed as Xavier himself possessed by Onslaught [Onslaught X-men, 1995]. Bishop then met with his sister who had been made a hard light projection thanks to Forge. At first he refused to accept her as his sister but when the projector was destroyed she reformed as a Photon based life form. Bishop accepted that his sister was finally back [X-men Annual 1996]. He demanded she join the X-men but she refused deciding that she would not follow in his footsteps the way she had before, reluctantly Bishop allowed her to join X-Factor instead [X.S.E #1-4]. Lucas was then abducted into space [Uncanny X-men v1. #341-345] and shared a brief romance with Shiar Princess Deathbird [Uncanny X-men v1. #348-372 and Team X 2000] (in an alternate time she gave birth to their daughter Aliyah Bishop) [X-men the End Book 1 #1]. Upon being returned to earth he was taken into another time line to battle Fitzroy. The resulting battle saw his sister and Fitzroy killed [Bishop #12-14]. Back on Earth 616 he joined Storm‘s Extreme X-men team where he learns that Gateway was his grandfather [X-treme X-men #4]. Over the course of these adventures he would befriend and mentor the third Thunderbird, witness the death of Psylocke and become mutually attracted to teammate Sage. When the mutant population swelled to millions he became a police officer in charge of District X also known as mutant town [District X #1-12]. When the mutant Messiah was born Bishop went against his teammates and tried to kill the child since in his time she would kill millions of humans and cause his entire timeline. Bishop faced the entire team of X-men who had become his friends and family. He even lost an arm in his bid to kill Hope [X-men: Messiah Complex]. When the child was taken by Cable into the time he commandeered a time machine and cybernetic arm from Forge to follow [Cable v2. #1]. In his obsessive bid to kill the child he murdered or lead to the death of billions and in the process becomes Earth’s most notorious mass murderer [Cable v2. #9]. When that failed he allied with Cable’s clone Stryfe the heir to Apocalypse [X-men Messiah War]. When that failed he allied with the Brood [Cable v1. #18-20]. By the time he tracked them down Hope was a teenager and started manifesting her powers. In a finale battle with the duo he was sent into the desolate and dystopic future of year 6700 he had created through his many schemes and left stranded there [Cable v2. #22-24]. He returns on an unknown mission facing Storm and the Uncanny X-force. So is Bishop alive is it another way for Marvel to get rid of the black guy again?!?!??! I just hope he has dreads and not the white boy hair! And now I’m hear’n that a new cyclops is gonna be black?!? Have not heard that one Erik. Source? Story wise, I hate two things: Clones and time travel. As cool as Bishop was, every time he got onto the “I must do this to save the future” jags I got bored. I did love his no nonsense, practical, military attitude. When he Turned on the X-men he became one of the absolute worst villains of all time. A baby killing psychotic, willing to do anything to eliminate his target, even if it meant killing so many more to get the job done. Recently, it seems he’s back in the present, with his missing arm grown back, and once more on the side of the good guys. I can’t tell if it’s terrible writing, or the return of a great character.